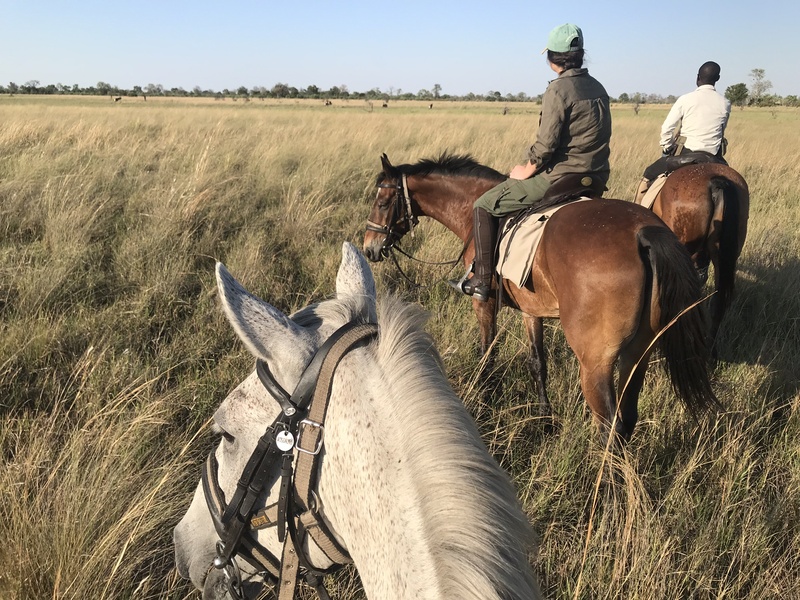 In a series of three blogs In The Saddle’s Becky Clarke writes about her visit to the Okavango Delta….here is Part 1 and her visit to Motswiri Camp. 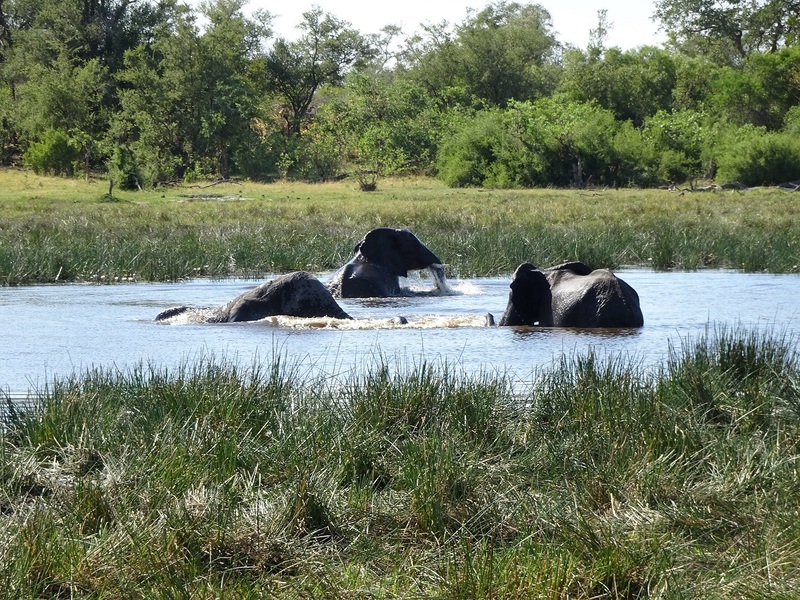 In November 2018 I packed my 15kg bag and headed towards Heathrow and a flight to Botswana’s Okavango Delta. 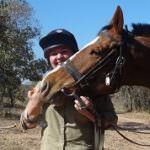 Having worked at In The Saddle a number of years, I’d learnt lots about our camps there and after hearing our guests’ experiences, I was eager to visit them for myself! As soon as I stepped off the plane at Maun airport, I was hit by the African heat. Once I’d cleared customs it was time to hop on the light aircraft that would take me to my first destination – Motswiri Camp. 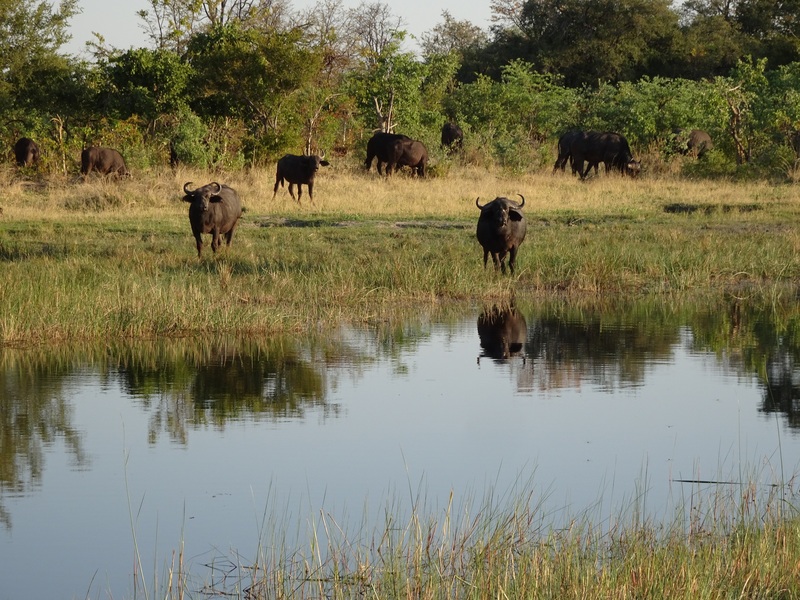 Technically in the Selinda Spillway, Motswiri Camp is in the far North Eastern corner of the Delta. I’m the only one arriving today and as we drive into camp, I’m met by camp manager BK and some of his team. 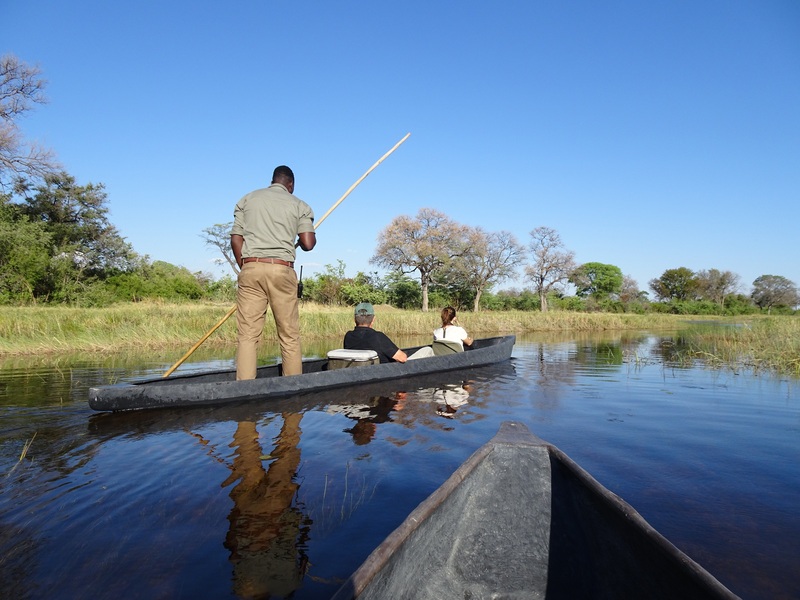 After a refreshing drink and a quick freshen up, I meet the rest of the guests in camp and we head off on the Mokoros. I’d been in Africa just a few hours and by the time we arrived back into camp after our Mokoro trip, I’d seen Kudu, Elephant and Wild Dog! It was at this point I knew this trip would exceed all of my expectations. The next morning I am woken at 05:00 with a steaming pot of coffee at my tent. Breakfast was eaten around the campfire and after eating as much as I could manage at the time (a handful of grapes!) the riders were led towards the stables. Today I am handed a beautiful flea-bitten grey named Mohonono (after the tree). Our mornings ride gets straight off to an exciting start as we meet up with a heard of Zebra and are lucky enough to canter alongside them a while. It’s not long before I see my first elephant quickly followed by sightings of hyena, roan antelope, spring buck and hippo. Back at camp, we ate brunch overlooking the river in front of camp before heading back to our tents to freshen up and shower. 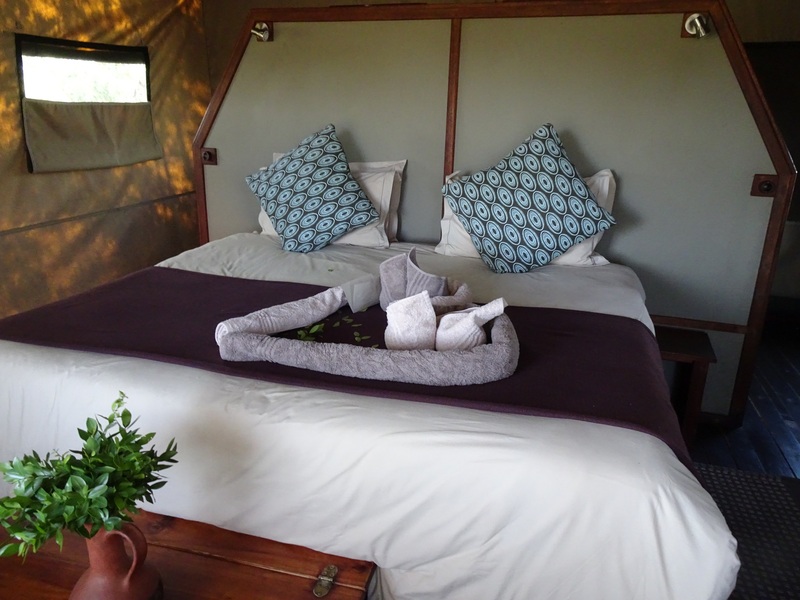 The tents at Motswiri are in my opinion what defines glamping! All of the tents are on wooden decking, have sliding doors, made up beds and running water. The rooms are beautifully presented and include a number of toiletries in case you’ve packed extra light like me! Later in the day everyone met at the main tent for afternoon tea before our next activity. At 17:00 I headed out again with my wonderful guide Witness and since the other riders had left camp after lunch, we were the only ones out. This afternoon’s ride was much steadier than the morning and we rode for only about 1.5 hours before returning to camp. It surprised me how much water we came across because I knew that by November the flood waters have mostly receded. I hadn’t been expecting anything more than a puddle! I’m not sure what I’d expected but it wasn’t this much water! After dinner we were treated to a night drive and headed off in the vehicles with a spotlight at the ready. Not far from camp we met up with a group of elephant and had to slowly make our way around them to get clear. 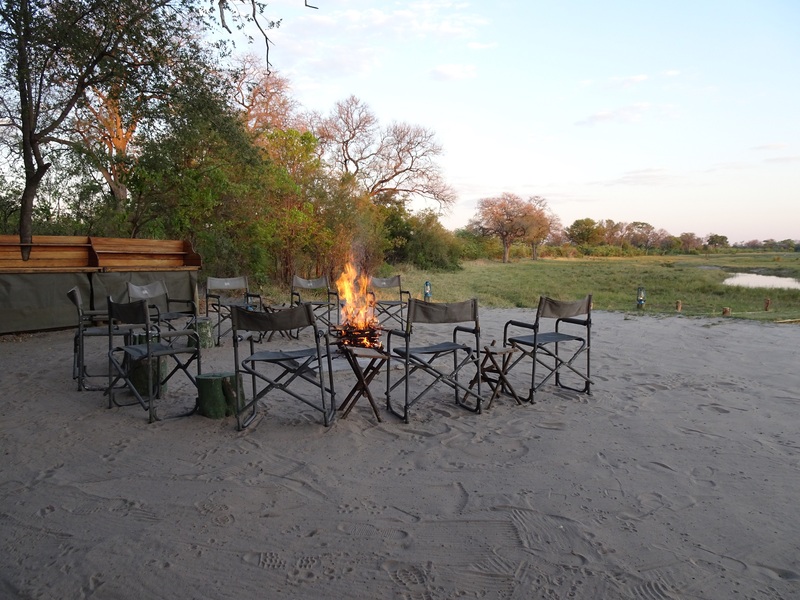 We saw plenty of wildlife including hyena, impala and a huge herd of buffalo before returning to camp. 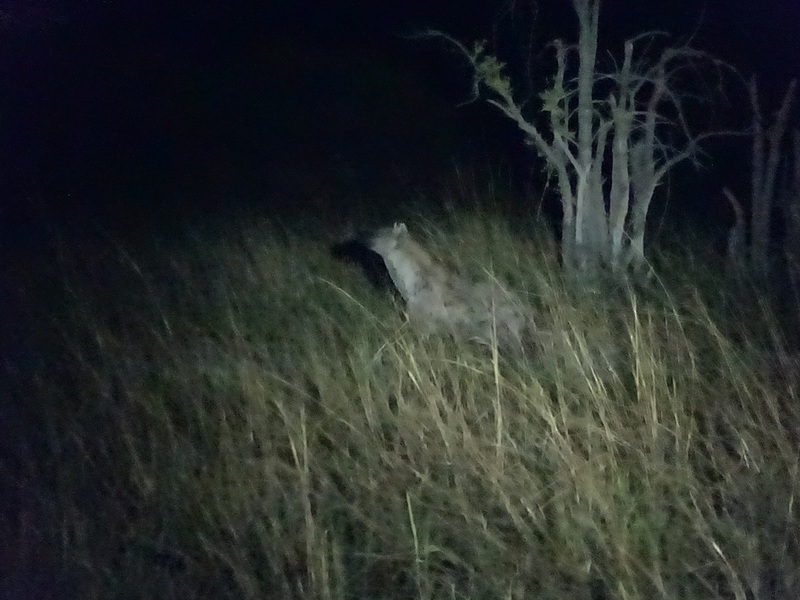 Hyena spotted during the night drive. After another beautiful sunrise, Witness and I set off again the next morning. I was handed the reins to a new steed called Taylor, a big bay gelding. Today the heat seemed to intensify more quickly than the day before and after a couple hours of riding, I was ready for our drinks stop and the chance to cool off. Taylor and I cooling off in the water. He knew how handsome he was! 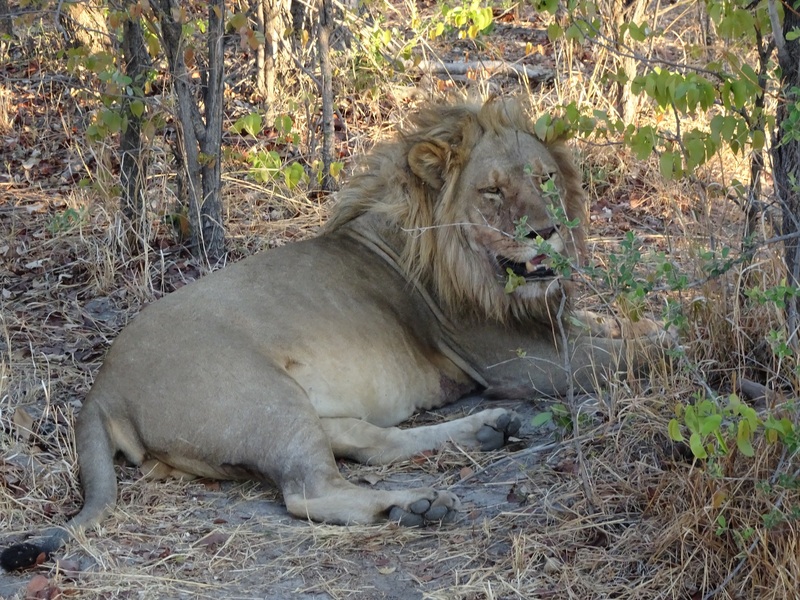 The second lion was younger and seemed very nervous of the vehicle. He slipped in and out of the bush careful not to let us get a good view. It took a good few minutes before he too lay under the shade and relaxed. After watching the two for a while, we headed back out into the open to enjoyed sun-downers at a safe distance! On the journey home we were lucky enough to spot hyena, a herd of sable antelope, impala and hippo. Two-boy even managed to get us back to the camp in time for dinner at 19:30. Elephants crossing in front of the horses grazing paddock. Exhausted after dinner, I fell asleep quickly. All too soon I was woken by a noise outside my tent – probably nothing but my overactive imagination. Since I was awake I went to the back of the tent to refill my water glass and on my way back to bed, I heard a noise that froze me mid-step. There was an elephant outside my tent. I hardly breathed for the next minute as I listened to the slow and heavy movements coming from just few metres away. Slowly I tiptoed back to the bed and crawled inside to wait as my night visitor wondered off, his (or her) footsteps growing quieter. Phew! In our briefing on arrival we had been given clear instructions not to leave our tents at night and I had a loud hooter to alert staff should I be concerned. It was exciting but I knew he would soon walk on by. After my early morning wake up, I was already up and sat outside as my coffee arrived. I spent a while gazing out over the river from my tent deck and watched as a couple of Kudu came down to drink. 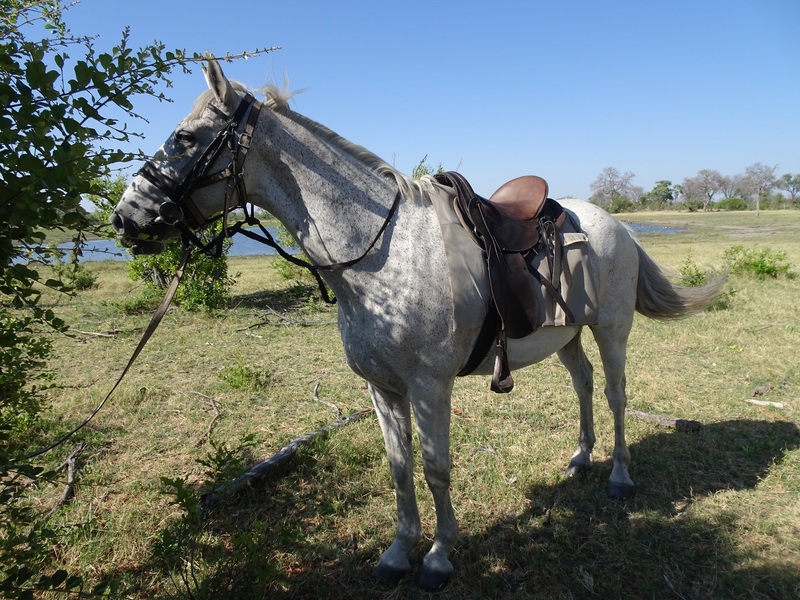 This morning was my last activity at Motswiri and so I chose to ride Taylor, the big bay. I rode out with Witness (and a back-up guide) for about three hours and headed over to a new area. 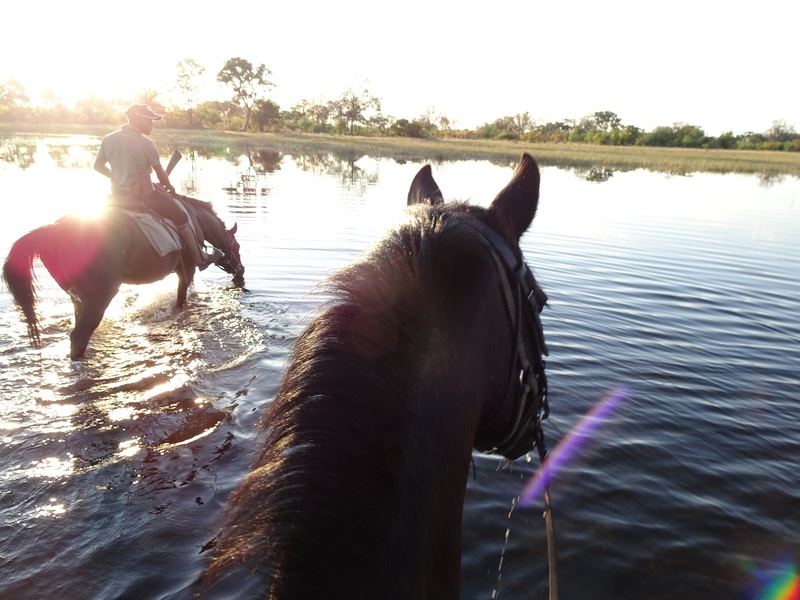 I couldn’t believe how diverse the scenery was – one minute we’d be riding along dusty tracks, then through thick trees before emerging out into lush green areas with water channels crisscrossing them. It was beautiful. Buffalo that came down to drink as we watched on from the other side of the water. After lunch I headed back to my tent for a shower and packed up my belongings. All too soon it was time to meet Witness for the short vehicle drive to the airstrip. It was here we said goodbye and I wished that I could somehow stay longer and just ride Mohonono one more time! 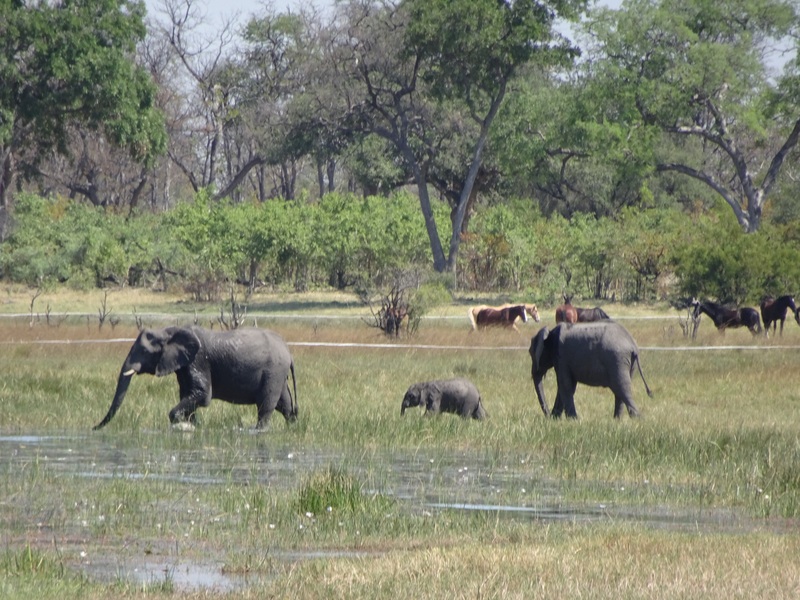 But it was time for part 2 of my adventure in Botswana! Looking out over the dry grassland at a herd of Sable antelope. 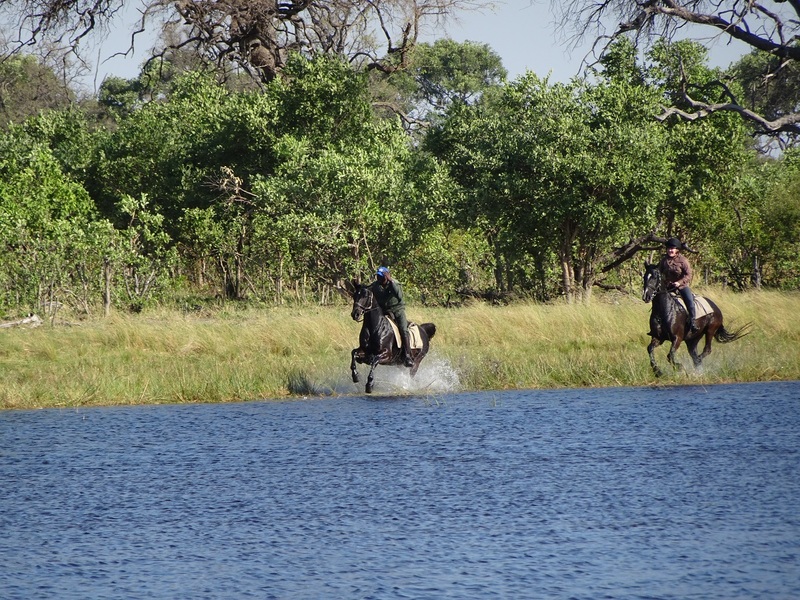 For more information on Motswiri camp please visit our website or contact Becky on +44 1299 272 244 or email Rebecca@inthesaddle.com.